I LOVE Totally Target. You help me save A LOT. Thank you!!! Like you on Facebook and thank you! Like you on facebook (but really love this site). Commenting here! Good luck to everyone! I like TotallyTarget on facebook. Thanks for the opp to win. 🙂 Love you. Hi, would really love to win this. Thanks for the giveaway, Kerry! I “like” Totally Target on Fb. Already like you on Facebook! Thanks! I also like TT on Facebook and recommend it to everyone! I follow you on FB and love to see all the newest deals. Thank you!! Would love to win this card to put all your great tips to use! i “like” and follow you on Facebook! I would love to win–thanks! I love these Target WOW cards. They’re so much fun! I love Target gift cards, they are the cleverest cards out there. 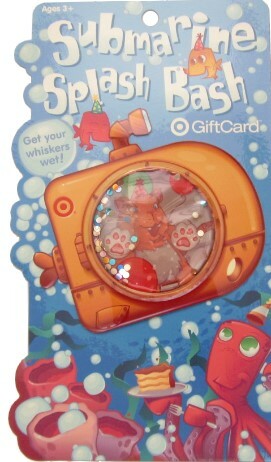 This submarine card is cute and clever.